Market research has shown that some consumer groups have positive attitudes towards meat production systems that pay attention to sustainability issues such as animal welfare and environmentally friendly production methods. However, it is also apparent that for the majority of consumers the relationship between citizenship and consumption behaviour is weak. What people think in their role as citizens related to pig production does not appear to significantly influence their pork consumption choices; citizens are increasingly reacting on animal welfare and environmental protection problems in pig production at the farm level, but this does not necessarily mean that such sustainability issues affect their choice in the shop (Krystallis, de Barcellos, Kügler, Verbeke & Grunert, 2009). This is some of the conclusions from a recent study based on data collected from 1931 households in four European countries (Belgium, Denmark, Poland and Germany). Attitudes towards pig meat production systems were investigated by means of a choice experiment. 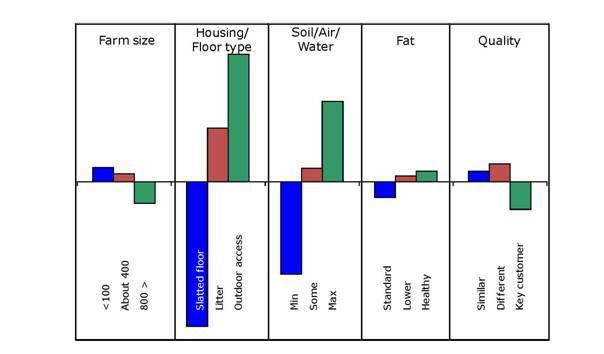 A range of pig production systems were evaluated based on consumers' preference ("utility") towards a number characteristics of the system's, such as farm size (number of animals), type of floor/housing, efforts to protect soil/air/water at the farm level, animal feed influencing fat content of the pork product, and quality of the final pork product. The results were analysed using conjoint analysis (Figure 1). Note: Horizontal line indicates zero utility (neutral preference) for the farm attributes under examination; bars above the line correspond to positive utility (preference); bars below the line represent negative utility (non-preference). From the study it was concluded that even when some segments of consumers across the four countries under investigation buy and eat pork products, negative attitudes towards pig production can have a negative impact on the social acceptance of certain forms of pig production, which in turn can lead to market constraints and other difficulties for pig producers. However, for the majority of consumers social roles played in favour of sustainability issues do not affect people in their everyday role as consumers.